On Wednesday night, about 200 concerned Midland residents and business owners congregated in the North Simcoe Sports and Recreation Centre for one final chance to say their piece before Midland Council made its decision regarding integrating Midland Police Service with OPP. Numerous pleas of five minutes or less were made on both sides of the debate over the course of the night, ultimately amounting to about 2 1/2 hours of opinions and arguments one way or another. The arguments against adopting the OPP model tended to centre around emotional issues, such as MPS’ place in Midland’s cultural fabric and their engagement with the community, as well as a good deal of skepticism about whether OPP will deliver the savings forecast in the analysis. Arguments in favour of the OPP offer focused more on economic savings and the sustainability of rapidly rising emergency services budgets. Of course, these are generalisations, but they pretty much capture the mood on the night. As should be expected, more people turned out in favour of MPS than OPP. After all, the 109-year history of the Midland Police Service has gathered a good-sized cadre of loyalists, while things like an economic business case tend to elicit glazed eyes and apathy among the general populace … at least until the complaints begin around tax time! Once all the cases were made and information presented, Council convened for a special meeting to debate and decide on the issue. Only two Councillors seemed to come to the table without having their minds made up. Councillor Main spoke about his inner conflict and reiterated some of the points made earlier in the evening, but didn’t make his position clear until the final tally, when he still hesitated before casting his “No” vote. Councillor File was also torn, but the deciding factor for her was having confidence that today’s rate payers wouldn’t be saddled with the entire up front cost of transition. Once she felt comfortable that the costs could be distributed over the coming years and paid out of the OPP savings rather than through tax increases, she fell on the “Yes” side of the fence. Councillors Contin and Oschefski were much more committed to their “No” positions and didn’t hesitate to express their support for continuing with Midland Police Service, although Councillor Oschefski also emphasised that he would strongly support whichever decision Council made. In a similar vein, Councillors Canning, McDonald and Strathearn, Deputy Mayor Ross and Mayor McKay were firmly convinced of the pressing need to adopt OPP. Interestingly, the positions of Councillors largely mirrored those of the residents who spoke earlier. All Councillors recognised both pros and cons, as well as the impact either decision would have on the Town. Doubts about whether Midland will actually realise savings, and concerns about whether OPP will engage as effectively with the community, generally ruled the collective consciousness of the “No” Councillors. The “Yes” side was very much influenced by fiscal responsibility and recognition of the challenge they currently face funding other community initiatives while coming up hard against their budget ceiling. In the end, the motion passed 6-3, which is a strong mandate for change but still leaves MPS supporters with a bitter pill to swallow. 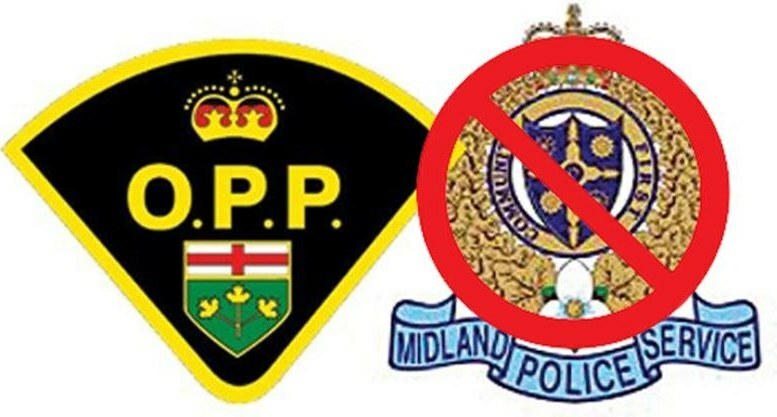 We can only hope their concerns will prove unfounded as OPP takes over policing duties in Midland, and that the promised savings prove to exceed even the “Yes” side’s expectations. That would be a true win for Midland and should help heal whatever rifts this issue has opened in the community. At MidlandCommunity.ca, we are certainly confident this will be the case, and hope we can all come together in the coming years to support our police in the same way we have for the past 109 years. Be the first to comment on "Town of Midland Council Accepts OPP Bid"